Loaches are great bottom dwelling scavengers that do well with a varied diet. They can be difficult to breed and are very sensitive. You must keep good water quality for them to be healty. Beware when you choose one of these fish, some can grow quite large. Widely found in North America, Europe, Asia, and Africa, these common fish are usually captured in the wild and sold to aquarists. Some can grow to larger sizes than you may want in your tropical fish aquarium, so care should be taken when selecting these fish as new friends. You should have plenty of places to hide in your aquarium for these guys to be happy. They are nocturnal scavengers and spend most of the day in caves or under aquarium decor. When you turn your aquarium lights out for the night, they will come out and go right to work cleaning bits of food off the bottom. These fish like to have good water quality and are sensitive to rapid changes. You should only keep them in an established aquarium. They are commonly mistaken for skinned catfish, but actually have very tiny scales. They do have barbels, like a catfish, and use them to find food in the substrate of your aquarium when there is no light. Mostly peaceful, these interesting little guys are good community fish. They may sometimes be aggressive toward each other, especially the males. Keeping different species is not a problem most of the time though. Just be sure that you don't get one that will outgrow your tank and you will have a helpful friend. Selecting the right Loach for your tank size is key when adding them to your aquarium. Below are some common types of Loaches. Look at their profile pages for more information. Peaceful to other fish, this little guy can be aggressive with its own kind. Funny and colorful, this little guy can get bigger than you think. Often sold as a small eel, this is actually a Loach. These scavengers also love to eat fry. Don't try to breed other fish in the same tank. This nocturnal scavenger needs excellent water quality to be healthy. For more information, go to Wikipedia's Loaches page. Do You Have A Favorite Loach? We all have a favorite fish. Somewhere in your aquarium you have a fish that you are proud of. 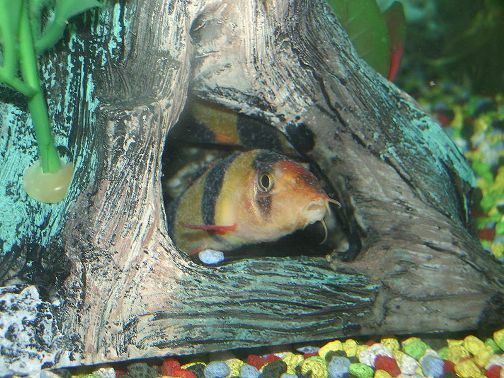 If you have a favorite friend that is a Loach, take a picture and share a story about it with us.